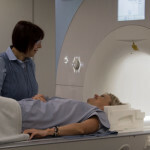 Magnetic resonance imaging (MRI) is a medical imaging technique used in radiology to form pictures of the anatomy and the physiological processes of the body in both health and disease. MRI scanners use strong magnetic fields, radio waves, and field gradients to generate images of the inside of the body. MRI is based upon the science of nuclear magnetic resonance (NMR). Certain atomic nuclei can absorb and emit radio frequency energy when placed in an external magnetic field. In clinical and research MRI, hydrogen atoms are most-often used to generate a detectable radio-frequency signal that is received by antennas in close proximity to the anatomy being examined. Hydrogen atoms exist naturally in people and other biological organisms in abundance, particularly in water and fat. For this reason, most MRI scans essentially map the location of water and fat in the body. Pulses of radio waves excite the nuclear spin energy transition, and magnetic field gradients localize the signal in space. By varying the parameters of the pulse sequence, different contrasts can be generated between tissues based on the relaxation properties of the hydrogen atoms therein. Since its early development in the 1970s and 1980s, MRI has proven to be a highly versatile imaging technique. While MRI is most prominently used in diagnostic medicine and biomedical research, it can also be used to form images of non-living objects. MRI scans are capable of producing a variety of chemical and physical data, in addition to detailed spatial images. MRI is widely used in hospitals and clinics for medical diagnosis, staging of disease and follow-up without exposing the body to ionizing radiation. MRI has a wide range of applications in medical diagnosis and over 25,000 scanners are estimated to be in use worldwide.MRI affects diagnosis and treatment in many specialties although the effect on improved health outcomes is uncertain. Since MRI does not use any ionizing radiation, its use is generally favored in preference to CT when either modality could yield the same information. (In certain cases, MRI is not preferred as it can be more expensive, time-consuming, and claustrophobia-exacerbating). MRI is in general a safe technique but the number of incidents causing patient harm has risen. Contraindications to MRI include most cochlear implants and cardiac pacemakers, shrapnel and metallic foreign bodies in the eyes. The safety of MRI during the first trimester of pregnancy is uncertain, but it may be preferable to other options. The sustained increase in demand for MRI within the healthcare industry has led to concerns about cost effectiveness and overdiagnosis. MRI is the investigative tool of choice for neurological disorders, as it has better resolution than CT and offers better visualization of the posterior fossa. The contrast provided between grey and white matter makes it the best choice for many conditions of the central nervous system, including demyelinating diseases, dementia, cerebrovascular disease, infectious diseases and epilepsy. Since many images are taken milliseconds apart, it shows how the brain responds to different stimuli; researchers can then study both the functional and structural brain abnormalities in psychological disorders. MRI is also used in mri-guided stereotactic surgery and radiosurgery for treatment of intracranial tumors, arteriovenous malformations and other surgically treatable conditions. Cardiac MRI is complementary to other imaging techniques, such as echocardiography, cardiac CT and nuclear medicine. Its applications include assessment of myocardial ischemia and viability, cardiomyopathies, myocarditis, iron overload, vascular diseases and congenital heart disease. Applications in the musculoskeletal system includes spinal and pelvic imaging, assessment of bone and joint disease, tendon and muscle injuries, as well as bone and soft tissue tumors. Hepatobiliary MR is used to detect and characterize lesions of the liver, pancreas and bile ducts. Focal or diffuse disorders of the liver may be evaluated using diffusion-weighted, opposed-phase imaging and dynamic contrast enhancement sequences. Extracellular contrast agents are widely used in liver MRI and newer hepatobiliary contrast agents also provide the opportunity to perform functional biliary imaging. Anatomical imaging of the bile ducts is achieved by using a heavily T2-weighted sequence in magnetic resonance cholangiopancreatography (MRCP). Functional imaging of the pancreas is performed following administration of secretin. MR enterography provides non-invasive assessment of inflammatory bowel disease and small bowel tumors. MR-colonography can play a role in the detection of large polyps in patients at increased risk of colorectal cancer. MRI is the investigation of choice in the preoperative staging of rectal and prostate cancer, and has a role in the diagnosis, staging, and follow-up of other tumors.